MOTORHEAD - THE WORLD IS YOURS RE-ISSUE VINYL (LP) | Online Shop | Wizard LTD. Album: "THE WORLD IS YOURS RE-ISSUE VINYL (LP)"
The World is Yours is the twentieth studio album by the British heavy metal band Motorhead, which is due for release in December 2010. The name of this album was confirmed in a July 2010 interview with drummer Mikkey Dee. On November 3, 2010, Future PLC, a UK media company, announced that Motorhead are to release The World is Yours via an exclusive publishing deal with Classic Rock magazine on December 14. 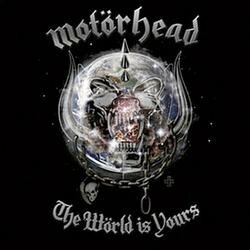 The standard CD release of The World is Yours will go on sale on January 17, 2011, through Motorhead&apos;s own label, Motorhead Music, distributed via EMI Label Services.